Good update, Joe. Sounds like things are going from busy to busier. 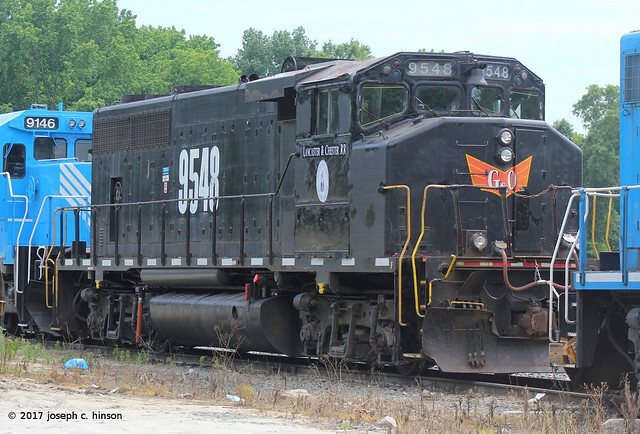 I will have to wait a few day before getting an RP-worthy shot of the now-L&C 9548. In the meantime, there is this. They discarded the G&O wings on each side of the cab, but them on the front and back of the logo. Also gone is the YVRR logo that was on the cab side and the YVRR-lettering. They applied the Springmaid logo to both sides of the cab as well as Lancaster & Chester RR. Lastly, the touched up the black paint on the cab where the CN red was coming through as well as repainting the numbers on this side of the long hood. The numbers on the other side have held up pretty well. Last edited by ShortlinesUSA; 05-31-2017 at 07:14 PM. I kinda like the opposing logos. I think I might be in the railfan minority on that though. Last edited by Joe the Photog; 05-31-2017 at 05:52 PM.